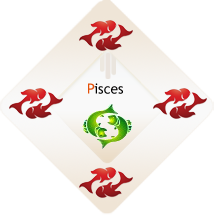 The last sign of the zodiac embodies the idea that the world is created by opposite energies that complement and balance one another. Pisces is the living embodiment of yin and yang. That is to say, you want balance in your life, and you’ll go out of your way to find it. But you can also do without or function under extreme conditions, as if you’re drawing energy and information from some parallel universe. When we think of the great Pisceans of all time, Albert Einstein comes to mind, and this is someone who clearly understood alternate dimensions of reality and how what we see is not all there is.